Miami, 1962. The members of a prominent South Florida family find their world challenged by the life-changing events of the era. The Kennedy assassination, the Cold War and the sudden influx of Cubans to Miami set the stage for an all out showdown as past, present, east and west all collide in this comic look at how we got to where we are today. "One of the wittiest yet realistic shows to premiere ... in many years." 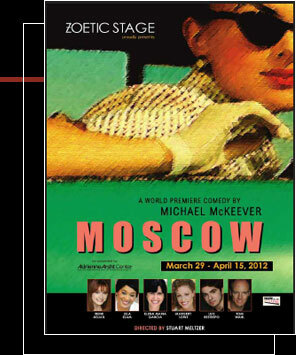 "Moscow ... is rich in so many ways with deep characters and dialogue that is quick and witty." 2012 Miami Herald "Top Theatrical Highlights"